They obviously firmed up their mind! ith any political formation. Nor am I being soft. I am just being realistic. Am equally aware that allegations are against many persons in Opposition parties too. But it was about the Focus as of now. ----Focus on the Main Culprit, the Ruling Party. End of the day if we paint all black but who will get us what the country needs now and in the near future? IAC cannot be an alternative overnight, it will take time. We have to get systems in place soon where we need the prime opposition party. In JLPBill the BJP was moving amendments for Independent CBI at least, had the Bill been allowed to be passed in the Rajya Sabha that night. Mr Jaitely,Ms Sushma Swaraj, Mr Advani and Mr Gadkari were receptive to our suggestions. Arvind and Bhushans had several meetings with them. And they agreed to support in some ways, not in all though. But at least they were not dismissive as the ruling party. Why must we forget this? -------I am being objective in this. I have no political affiliation, inclination or expectations. I want the movement to grow and reach the grass roots. As also Arvind's political party now in the making. 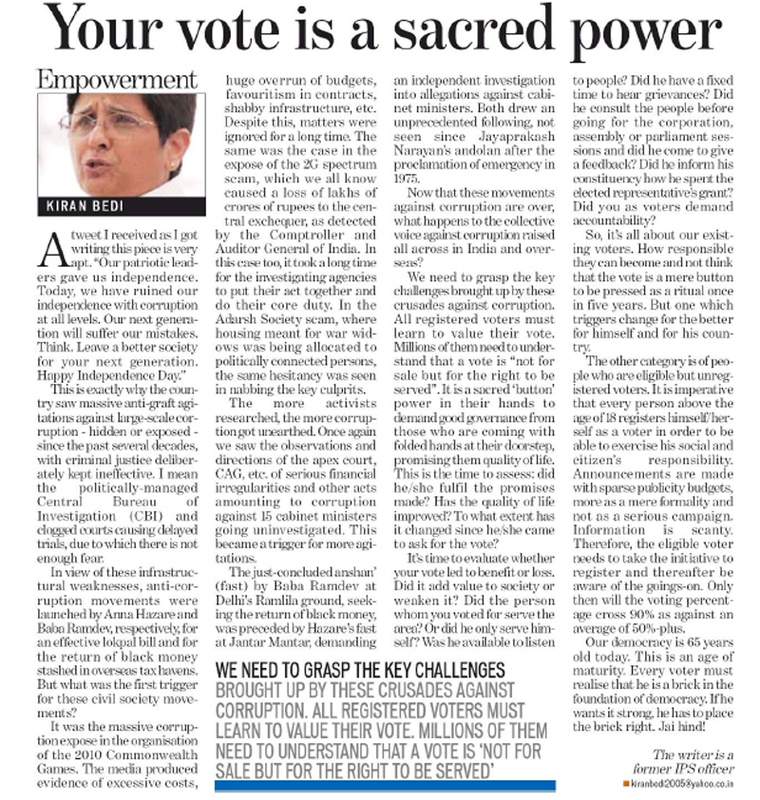 India needs honest political leadership and I look forward to widespread changes! But we got to be patient and inclusive! Without losing possible quarters of support! Even if we have ideological difference with them. For after all whatever comes they too shall be subordinate to the same independent CBI. They know it! I thank all the thousands of young volunteers all over country for continuing to have faith in the movement! And determined to make the difference!